The relationship between Football and Social Media is becoming more relevant every day, only this week did tweets about the Barcelona vs. Chelsea Champions League semi-final set a new Twitter record of 13,684 tweets per second. It was also a week that saw Real Madrid’s Kaka become the first athlete to break the 10 million Twitter followers barrier. The English Premier League is adding around 3 million new Facebook Likes and 350,000 Twitter followers every month – and this is expected to grow! According to the very excellent Football Social Media metric site – folos.im, there are currently a total of 28,707,607 Twitter followers across 1197 teams worldwide. Football Social Media has quickly become a primary channel for fans to find out the very latest about their club, the transfer market and live game commentary. It has also opened up a new wealth of insight into the lifestyle and daily routine of a professional footballer – what they eat, music they listen to and even their political ideology. 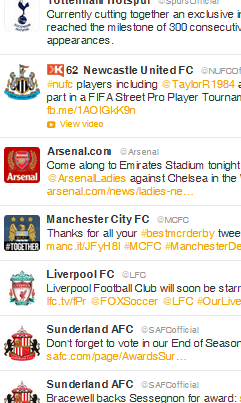 For clubs, Social Media is a new gateway to engage with their fans both domestically and abroad. As a marketing and engagement channel, Social Media is always switched on and always active. Clubs can tap into these communities for market research, product testing, sentiment analysis and even crowdsourcing new opportunities. Football Social Media creates more site traffic, new revenues for merchandise and above all – a better relationship between club and customer. But just because it’s clear that the fans want more from Social Media, it doesn’t mean that clubs should “jump in” without a strategy. If clubs set up a Twitter account without any real investment or purpose behind it, then they can expect failure. Sure, they might pick up a few thousand followers and get RT’d a lot on the back of their brand, but they will fail in that they’ve missed a massive opportunity. PURPOSE: What are you going to use Social Media for? Answering customer service enquiries? Fan engagement? Generate matchday sales? Promote site content? Brand reputation? PEOPLE: Who is your Social Media for? What age are they? What channels do they use? What are their passion points? Are your fans even on Social Media? PLATFORM: What channels work best? Where do you fans interact online? Message boards? Twitter? Facebook? YouTube? Google+? PERFORMANCE: How will you do it? Now you understand your audience and purpose, what’s the best way to reach your goals? What content will work best for you? How will you measure success? These are just a few of the questions clubs should be asking. They’re not revolutionary, nor are they complicated, but with a little time and effort around these elements football clubs can reap huge rewards. 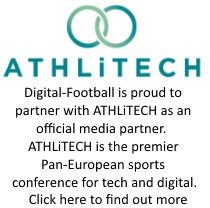 Thanks for the comment and the link – its a great piece and interesting to note football’s major part in Social Media!